the “at the door” of competitive systems to “Behind The Door” for HanGenix™. The HanGenix™ Compliance Assurance System enables the effective facilitation of W.H.O. guidelines. 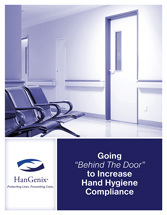 What sets the HanGenix™ Compliance Assurance System Apart is its ability to capture, 24/7, critical, clinical-specific hand hygiene data within the Patient Protection Zone™. The National University Hospital in Singapore published a clinical study in the Journal of Infection Control and Hospital Epidemiology validating the accuracy of the HanGenix™ Compliance Assurance System. We encourage you to request more information about conducting a trial of the HanGenix™ technology in your healthcare facility. An easy read executive overview of the HanGenix™ Compliance Assurance System. What Clinicians Are Saying About The HanGenix™ Compliance Assurance System. A transformative technology that is improving clinical outcomes, helping us meet, even exceed the highest standards of care, and helping us lower healthcare costs associated with hospital acquired infections. It is the answer we have been looking for.